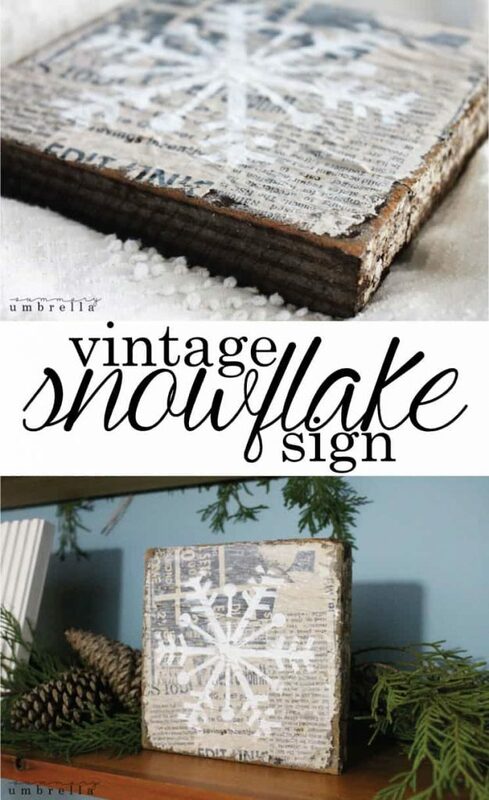 This DIY vintage snowflake sign is not ONLY gorgeous, but super simple as well. 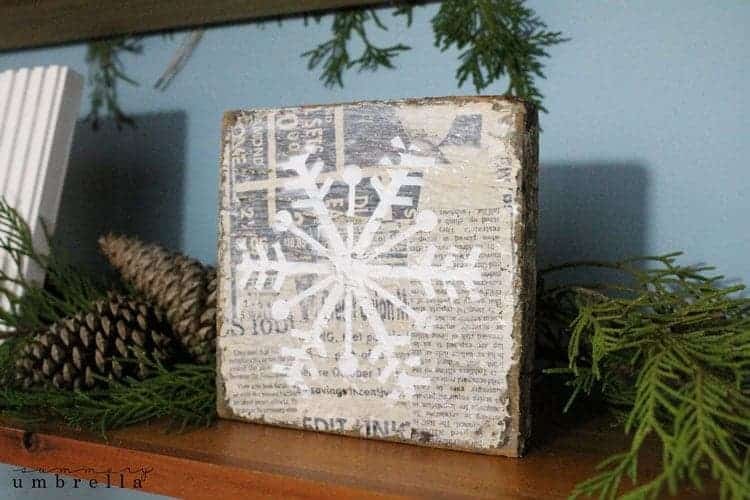 It includes easy to find supplies, a FREE snowflake stencil, AND a video! 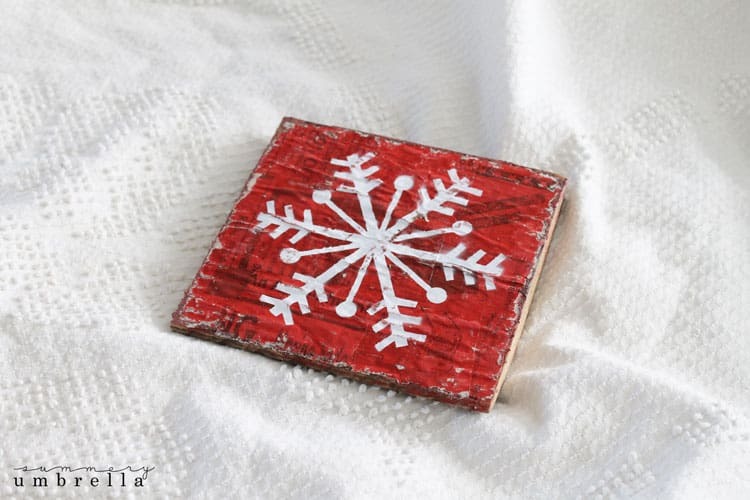 Make your own wood snowflake wall art with these easy tutorial. As you probably already know. I kind of have this “thing” for making signs. And you know what? I think you guys like making them as well. Today I’m going to be showing you how to make one of my favorite holiday ones. 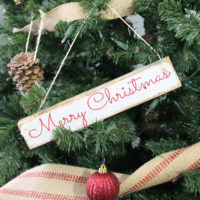 In fact, this DIY vintage snowflake sign is perfect for both Christmas as well as keeping it up for the colder winter months as well. 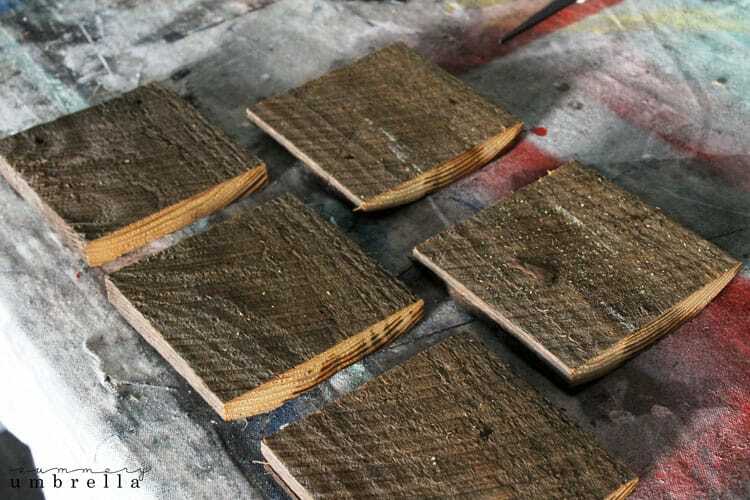 First, I cut a few pieces of scrap wood that I had on hand into 6″ x 6″ squares. 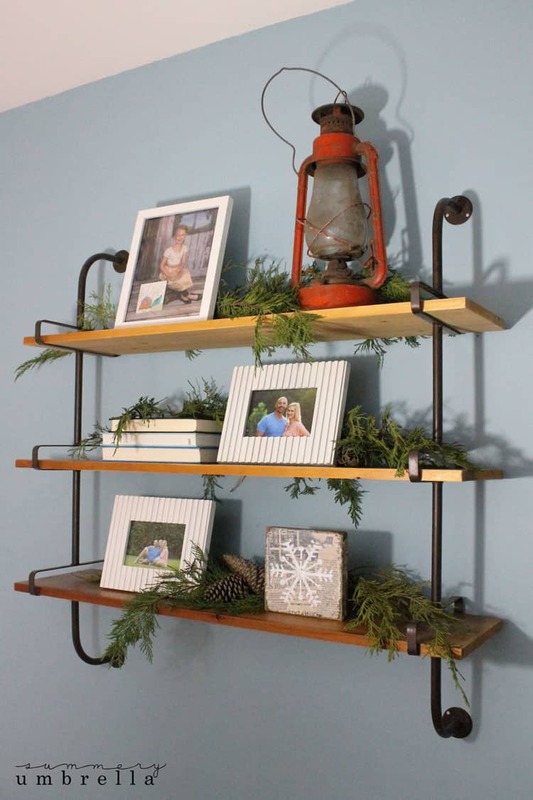 I used barnwood, but it’s not necessary. Just use whatever you have! 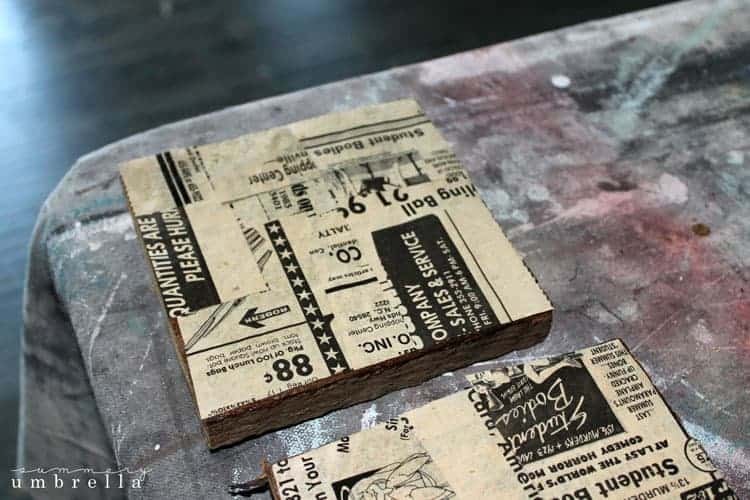 Next, using Mod Podge go ahead and glue strips of newspaper haphazardly to your boards. You don’t need to use any particular pattern. Just slap those babies on there. 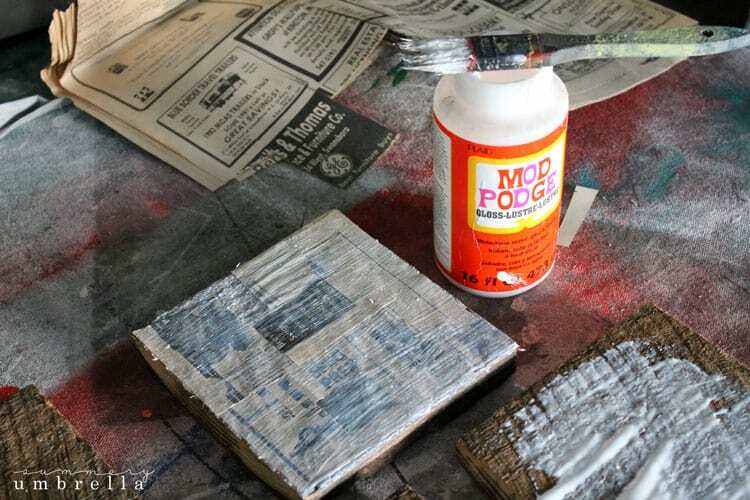 I like to put the glue on the board, stick the newspaper to it, and then add another layer of glue on top of it. I let mine dry for a few hours, but that was mainly because I was multi-tasking. You should be fine with just 20-30 minutes of dry time though. 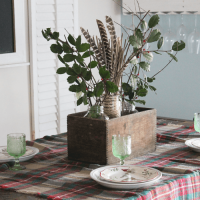 NOTE: It is not necessary to use the gloss Mod Podge. It was just what I had on hand. Matte would be perfectly fine as well. 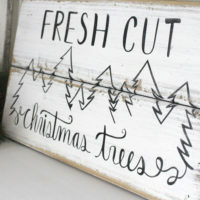 After your sign has dried it’ll look something like the photo below. For this next step I decided to do a video for you! Basically, it’ll show you exactly how to use a wash effect over your signs. This technique will allow your newspaper to still show through, but give it just a little bit of color as well. After you’ve painted your signs allow to dry for a hour or so. 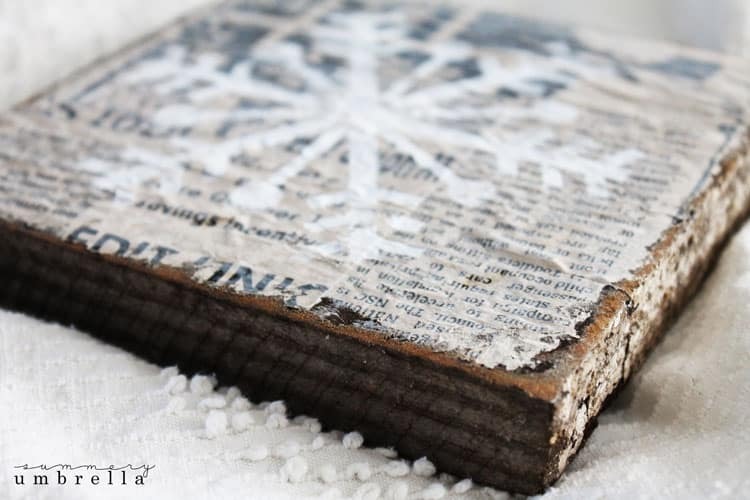 Then, add a thin layer of Mod Podge to the top. Make sure to let them dry overnight at this point. Whenever I’m going to be using vinyl it is always a good idea to allow your signs to “set” for many hours before using the vinyl. I can’t tell you how many times I’ve tried to rush this step, and ended up with ruined signs because the vinyl pulled the paint right off. After they’ve dried it’s time to print out your stencil! 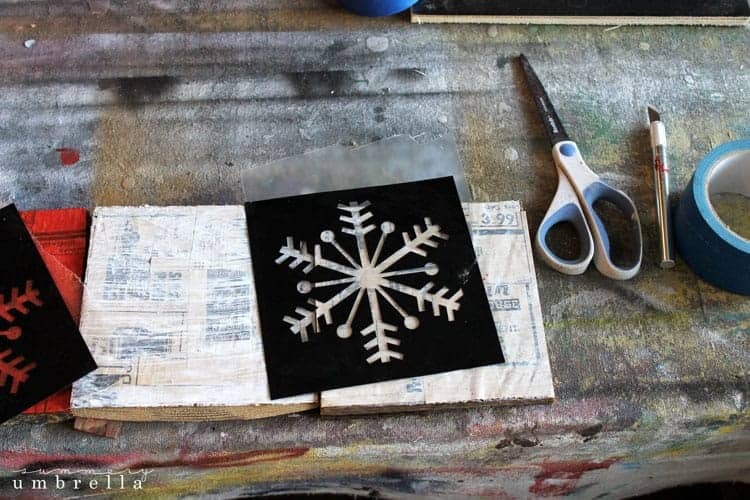 Download this FREE Snowflake SVG stencil, and cut it out with your cutter of choice. Mine? It’s gotta be my Silhouette Cameo. OBSESSED with it. I use it for everything. In fact, this is my second one! 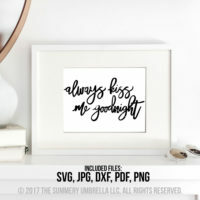 Just in case you’re unsure how to download a SVG file and put it into your Silhouette Cameo check out this tutorial I did previously in the year. Super helpful for sure! 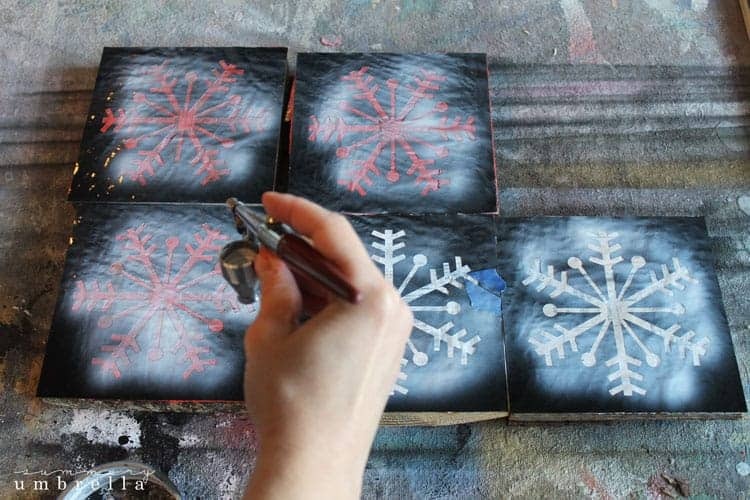 After you cut your stencil, pulled out the “innards” of the snowflake and placed it onto your signs it is now time to paint! Personally, I like to use an airbrush to paint all of my signs. 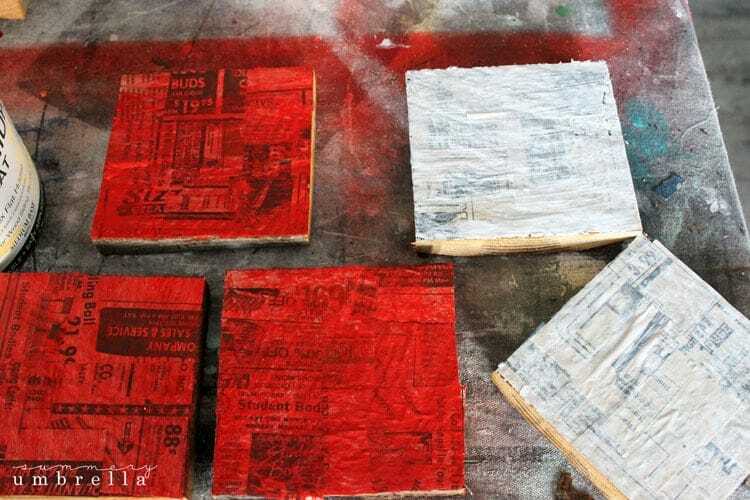 However, I totally understand that not everyone has this particular tool, and you can definitely use spray paint or even use a sponge and lightly dab paint onto your stencil. Just remember with any of these methods: ALWAYS USE LIGHT AND MULTIPLE COATS. This is key! Once you’re done painting and they have dried go ahead and pull your vinyl off. I like to give a slightly distressed look to them at this point. I get out my handy dandy Ryobi Cordless Orbital Sander and lightly sand down all of the edges, and even over the top. Then…. it’s time to display! :) Show them off in your home and especially on social media! These are pretty easy and they turn out stunning. I don’t know about you, but I just can’t get enough of seasonal decorating. I’m just not always sure about what to do after Christmas. 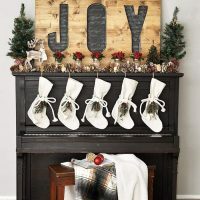 This wood snowflake art fits the bill perfectly, but if you’re looking for even more ideas, check out these 50 Winter Decorating Ideas for after Christmas. Didn’t this turn out gorgeous?! 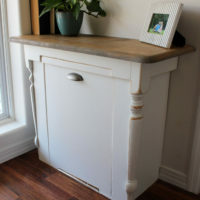 I just love the simplicity of this project, easy to find supplies, and the vintage style end result. Like I said. My all-time favorite holiday sign! What do you guys think? Super easy? Questions? Let me know in the comments section below! Pssttt…. 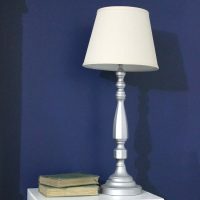 Don’t forget to check out my DIY project page chocked full of DIY and decorating goodness! Please remember: All photos, designs, images, patterns, and calendars (but are not limited to) are © Linda Zahora-Cathcart | The Summery Umbrella, LLC. These items are for personal use only. You may not reproduce, recreate, or sell in any way. However, please feel free to download for your own purposes. Also, this is exclusive content so you may not share these downloads with anyone, BUT I’d be most delighted if you directed your family and friends to this membership program. In fact, I’d be honored and thrilled. :) Thank you for your understanding! Hello. What kind of airbrush do you use?